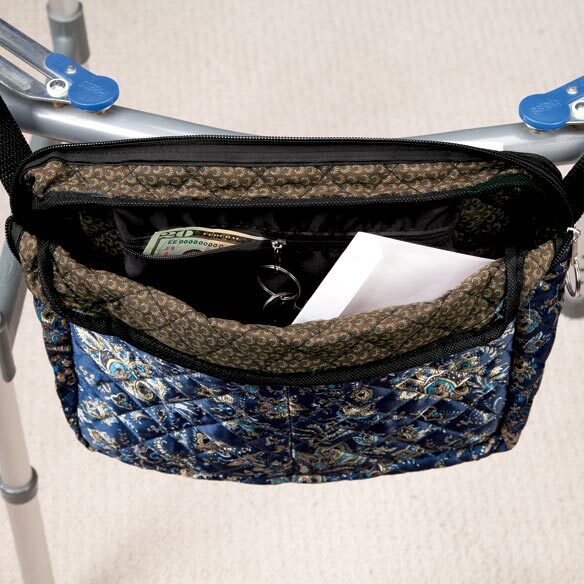 Versatile walker/wheelchair bag fits a walker or wheelchair to keep you organized on the go. Four outside pockets offer easy access to essentials. Zippered main compartment features an interior zip pocket for smaller items. Two hook-and-loop straps provide a secure, easily adjustable fit. Walker bag is made with wipe-clean, satin-feel polyester. 12"L x 13 1/2"W.
I use the product as a purse and it is safe to put money in it. The only thing about using it at a store you should not put any thing in side and it is hard to carry anything bulky in it. It is the most wonder thing a person can have on a walker or wheehchair. 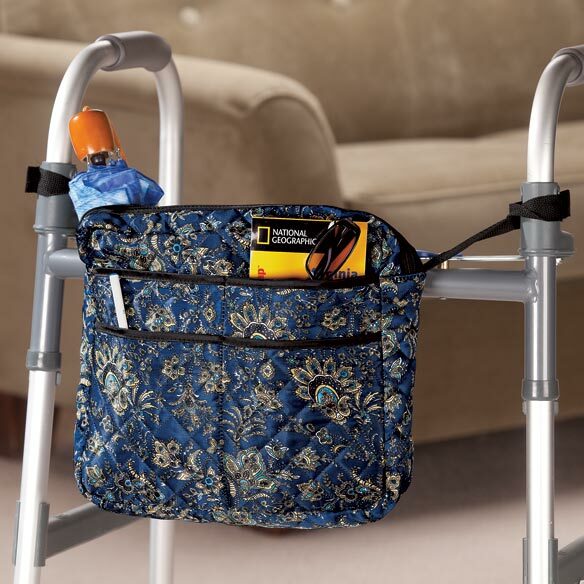 I ordered the blue bag for my grandmother's walker to replace a plastic baby carriage bag. I had sent directly to her and she was so excited to get it. She raved about how she loved the color. The fact that it had the four outside pockets and the top zips closed. It fits better than the make previous make shift carrier and it is so much more stylish. The price was so reasonable. I use the bag instead of a handbag and it is roomy since it has many compartments. I use this tote everyday. I'm in a healthcare place so I can keep important stuff with me at all times. I love my bag! It fits on my motorized wheelchair better than any other bag i've tried. The pockets are easy to access and the quilted fabric looks quietly elegant. I've received many compliments on it, and agree with all of them. I will use it to carry my phone & keys & other personal items. Tried this on my walker, didn't like it. You can't put much in it because the velcro isn't really strong enough to hold any weight. I will be offering this to someone else that will be happier with it than I am. I WOULD NOT CONSIDER THIS AS A PURCHASE OR TO SEND AS A GIFT. FRONT POCKETS WILL ONLY HOLD THIN, LONG ITEMS SINCE THEY ARE SEWED DOWN IN HALF. EXAMPLE YOU CAN NOT PUT IN A CROSSWORD BOOK. NOT EVEN GREAT FOR YOUR CELL PHONE IT IS TO LONG. THIS BAG NEEDS A LOT OF INPROVMENT. Purchased a previous one and like it so well purchased another. So when I walk my dog I can bring water and my phone with me so I can call someone if I were to fall and they are right on my walker. The velcro grips seem like a good idea for adjustable hanging. Like the zipper outside and a small one inside. Comes in burgundy, to match our snazzy wheelchair! I liked the color & # of pockets. I have been looking for an item like this for my mom's wheelchair. This looks like it will work well. so i can put my personal idems in.and hang on my walker. The overall appearance, and the number of pockets. it is exactly what we need to fit arm of wheelchair!! 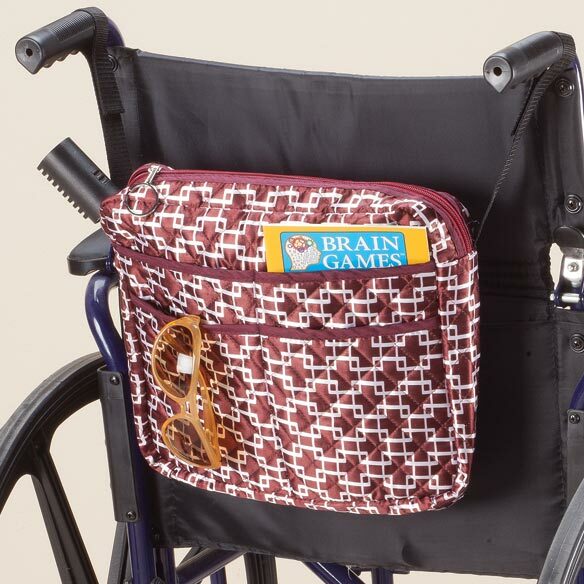 To provide storage for my wheelchair bond husbands book..glasses and other personal things..
Bought one for Mom's walker. She's using it for her items on HER side of the walker. Now we're getting one for the staff to use on the front side of the walker for their items. Beautiful, rich print. Holds what I'd expect it to... tissues, paper & pen, paperback book, calendar, cell phone. Have one for my house walker and need one for the folding walker (love it! Have *2* of them!) that I keep in the car. With this bag, I won't have to carry a purse to the doctors office. I have one that is getting worn and needed a new one. To replace the bag that came with my mothers walker. Need item to make getting around easier. 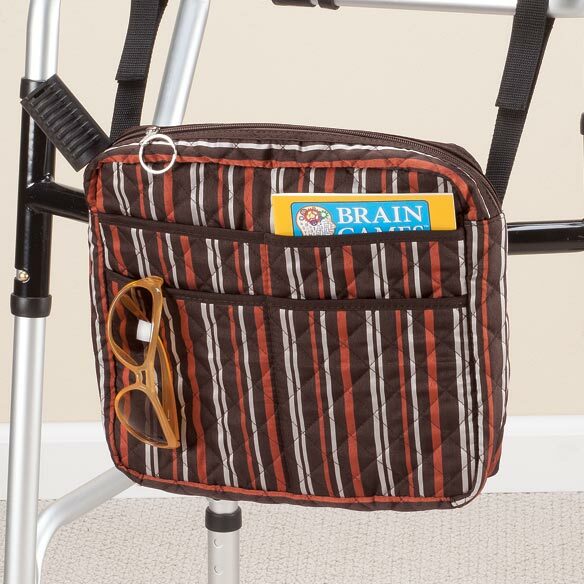 For my walker, to help keep me organized. If using a walker need help carrying things. so that Mom can transport all of her daily needs around with her. This was purchased for my mother to attach to her walker to organize her belongings. It was the right size and color. It helps to have a carry bag for things on my walker. auctualy I hope I got the right print as it was not clear which one on the website. Looks like it would suit my need. I'll find out when it arrives. How long is the main zippered compartment? Will it hold an average purse? BEST ANSWER: Thank you for your question. Th compartment is 12". It is not wide enough for an average purse to fit in it. We hope this information will be of help to you. 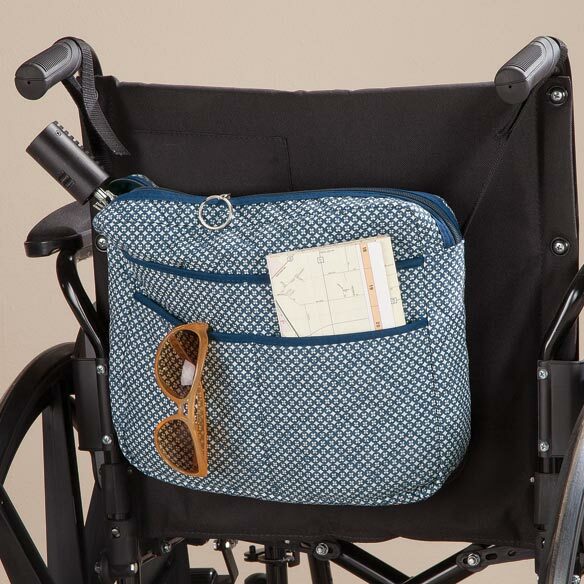 IS Walker/Wheelchair Bag made in the US? If not, what is the country of manufacture? BEST ANSWER: I do not remember where it was made I just know the last one I ordered has been wonderful and holds a lot of stuff because I just like a lot in my bag. Mine is Red & Blue with a flap pocket in the very front and it has a larger pocket across the whole bag and that zips and has a small pocket inside. Also on the front it has 2 deep pockets, one I keep my date book and the other my phone. The whole thing goes across the bar in the front with no ties to tear off Good luck! If I see it I will send a note o something OK?? Thank you for your question. The bag is made in China. We hope this information will be of help to you. is this the navy print? BEST ANSWER: Thank you for your question. It is a Navy Print color. We hope this information will be of help to you. Yes, I loved the extra spaces on outside for cell, etc. which does "navy print" mean? BEST ANSWER: Thank you for your question. The navy print is the floral one. We hope this information will be of help to you. The bag I bought was a floral print with the major color being navy blue. There were 4-5 other colors. Are you out of the Blue calico? I’m not interested in that color, I would prefer the 2nd picture from left side. The dark blue calico. BEST ANSWER: Thank you for your question. The Navy Print is the only one available. It is the dark blue floral like design. We hope this information will be of help to you. The page shows 4 different walker bags, 2 are blue. So which of these two bags considered to be the navy print? BEST ANSWER: Thank you for your question. The Navy print has the floral like design and is a darker blue. We hope this information will be of help to you. HOW WIDE IS THE BAG ON THE BOTTOM? BEST ANSWER: Thank you for your question. The bag is 2 1/2" wide. We hope this information will be of help to you.